— the first powered, heavier-than-air machine to achieve controlled, sustained flight with a pilot aboard. The Wright brothers also designed and carved their own wooden propellers, having a peak efficiency of 82%, a remarkable achievement. 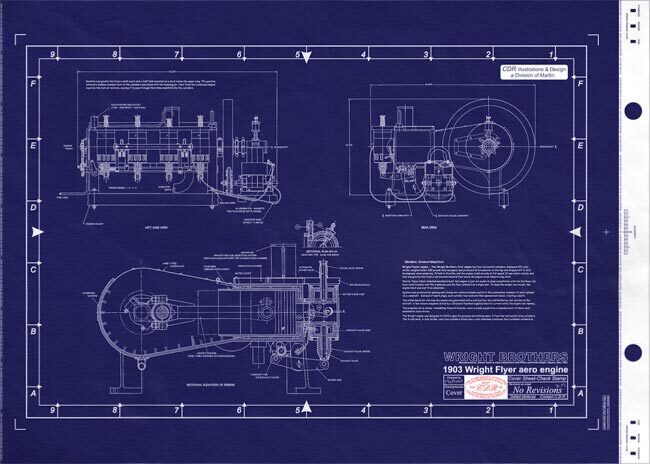 The Wrights wrote to several engine manufacturers, none met their need for a sufficiently lightweight powerplant. They turned to their shop mechanic, Charlie Taylor, who built an engine in just six weeks in close consultation with the brothers. Their bicycle shop employee Charlie Taylor became an important part of the team, building their first aircraft engine in close collaboration with the brothers. On December 17, 1903, at Kitty Hawk, North Carolina, the 1903 Wright Flyer became the first powered, heavier-than-air machine to achieve controlled, sustained flight with a pilot aboard. Continued from above… Wright Flyer engine had four horizontal inline cylinders. The 4-inch bore, 4-inch stroke, cast-iron cylinders fit into a cast aluminum crankcase that extended outward to form a water jacket around the cylinder barrels. The engine was cooled by water from a narrow vertical water reservoir mounted on a forward strut. The system was not a radiator in the typical sense, for the water did not circulate. The reservoir simply replenished the water jacket as the water evaporated from it. 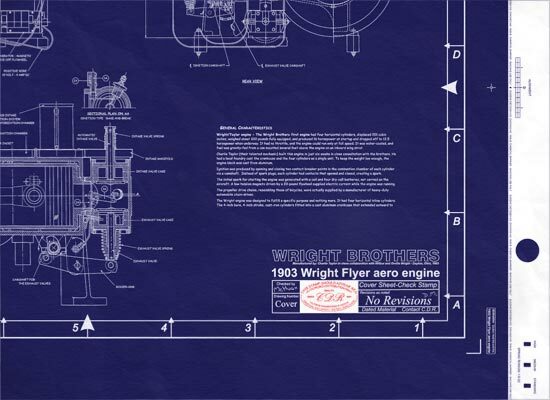 The Wright engine, with its aluminum crankcase, marked the first time this breakthrough material was used in aircraft construction. Lightweight aluminum became essential in aircraft design development and remains a primary construction material for all types of aircraft. The first battle for air supremacy was won when the Wright Brothers flew successfully at Kitty Hawk, North Carolina. Today the fate of nations is decided by air supremacy, which in turn is dependent upon production. Both of these the Wrights gave to us. In addition to building and flying the first successful airplane, they founded a concern to produce aircraft in quantities. The development of their designs throughout the life of the Wright Company, therefore, traces the early growth of these two factors. Their birth was an outgrowth of the experiments begun by Wilbur and Orville Wright in 1895 when for the first time they were inspired with the thought of flight after reading references to glider experiments by Otto Lilienthal in Germany. However, a man-carrying biplane glider constructed in 1900 in their bicycle shop in Dayton, Ohio, was their first practical experiment. This glider established the standard for all machines to follow, as all subsequent Wright designs were biplanes. Ribs, metal fittings, and the fabric covering were packed and taken to Kitty Hawk, North Carolina, where winds of sufficient velocity existed for gliding flight. Fate stepped in during the construction of this first machine. To facilitate transportation, it was deemed advisable that the bulky wing spars of spruce should be purchased near the site of the proposed flights. Unfortunately, spruce in lengths greater than 16 feet could not be found there, and as a result the wing area on the first machine had to be reduced from 200 square feet to 165 square feet. Being cautious, and having already experimented with kites, they decided finally that this machine could be flown in that manner. At that time, it consisted of nothing more than a biplane wing cellule covered with white French sateen and braced with struts and wires. and secondly, a satisfactory means of controlling the machine must be developed. To this end Wilbur and Orville Wright developed a system -- whereby an operator could control the machine both laterally and longitudinally. This was done by making a flexible biplane structure that could be twisted helically from tip to tip. Formed by two planes joined by vertical struts, it consequently was not braced between the upper and lower surfaces in a chord-wise direction. To keep the upper wing from moving forward and the structure from collapsing, two struts extending forward from the lower wing intersected diagonal members from the upper wing. Control wires -- connected from the center section to the outer extremities of either wing caused their angle of incidence to be changed gradually from the center outboard. When operated by the pilot's feet, the angle on one side increased while being decreased on the other. When the machine was flown as a kite, this system was operated by cords from the ground. A horizontal control surface -- was added to the end of the outrigger struts projecting forward from the wings, this surface being flexible in nature and supported at its center of pressure. The leading edge was restrained by springs, and the trailing edge could be moved up and down by the action of a control operated by the pilot. When the trailing edge was moved upward, the springs restrained the leading edge, causing the surface to change in camber. This resulted in a downward pressure that caused the machine to dive. Similarly, lowering the trailing edge caused a positive camber and resulted in the raising of the machine. No vertical surfaces were used on this first machine -- After flying it as a kite both with and without pilot aboard, the Wrights finally decided they had become adequately proficient in its operation to attempt a free flight. However, the first free flights were made with the warping control inoperative until such time as they had gained sufficient experience to operate both controls. Due to the small area and the fact that available information did not check with results found in operation, the machine did not have sufficient lift for flight except in relatively high winds. As a result, the Wrights were able to maintain only two minutes of actual gliding flight. They did, however, prove their system of control practicable and that an improved machine could accomplish successful flight. The wing area was increased, and the curvature of the wings decreased from a camber of 1-22 to a camber of 1-12. Except for camber, area, and a few structural changes, this glider was quite similar to the first. The operator lay prone and warped the wings with a foot control, while the camber of the horizontal elevator was controlled by hand. This machine was tested also as a kite. Later, several free flights were made, and after finding the camber not satisfactory it was changed to 1-18. The next difficulty encountered was with lateral control during gusty conditions when one wing would drop. un 1 he low wing, the increased angle of incidence due to the wing warp had a tendency to increase the drag, thereby slowing down the wing and preventing it from rising. To obviate this, it was decided to add a vertical surface to the rear, and this design change was incorporated in the third glider constructed in 1902. The first experiments on the 1902 glider were with a fixed biplane rudder having 12 square feet of surface. However, to overcome the slowing down of one wing, it was found that the rudder surfaces also would have to be controllable. During the latter part of the experiments, the rudder was changed from a biplane to a monoplane surface and its control interconnected with the wing warping. On the 1902 glider, the wing warping was operated by the movement of a cradle in which the pilot's hips rested while lying prone on the lower wing. This machine also had incorporated in its design a skid arrangement to protect the pilot and machine when landing on the sandy surface prevalent around Kitty Hawk. The glider proved successful, and over a thousand flights were made. During a period extending from 1901 into 1902, the Wrights had made a number of wind tunnel tests on airfoil surfaces obtaining information which undoubtedly contributed much toward the successful flights of this machine. First successful flight of the Wright flyer, 1903. Orville pilots the craft while Wilber runs alongside. In the light of the Wrights' wind tunnel experiments, an aspect ratio of 6.2 was used. The powered machine was larger than the third glider, but the structural design was otherwise similar. Launching during the glider flights had been by manpower, the pilot taking a prone position on the wing while assistants lifted the glider and operator into the air and ran down hill facing into the strong wind which prevailed at Kitty Hawk. 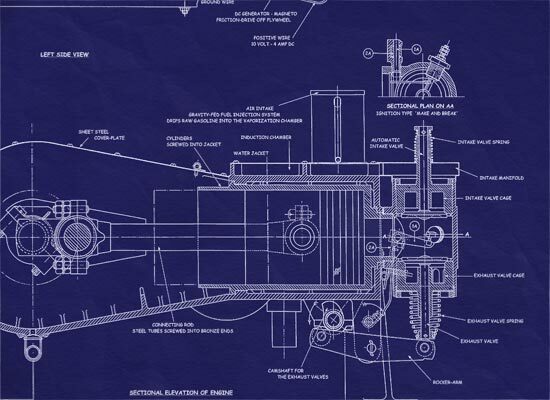 With the powered machine, such a system would not have been practicable, and it was necessary, therefore, to build some sort of launching apparatus. It was decided to launch the airplane from a rail and to land on skids, since the ground at the location was sandy and wheels would have dug in, causing considerable resistance. A launching rail 60 feet long was constructed of wood and its upper surface covered with metal. Upon it sat a small truck having two wheels which engaged with the rail and supported the machine. Contrary to a rather common belief, a catapult device was not used. The machine took off under its own power after a run of 35 to 40 feet. Flights were made against a wind of 24 to 27 miles per hour so that the relative ground velocity was low and an assistant ran along at the wing tip to stabilize the machine laterally while taking off. Control was similar to that of the 1902 glider except that biplane horizontal and vertical surfaces were used instead of monoplane surfaces. The warp and rudder were interconnected and operated by a cradle in which the pilot's hips rested. The horizontal control surface was located forward and it was operated by hand. This biplane horizontal surface varied from that of the glider in that it was supported at the center of pressure and arranged flexibly so that the leading edge was moved down as the trailing edge was lifted upward. The wings warped helically, but only in the two outer bays, since the center portion of the structure had to be braced rigidly in order to carry the engine and the driving mechanism for the propellers. Two pusher propellers, driven in opposite directions by chains running in steel tubing, were mounted on struts between the upper and lower rear wing spars. These struts were made from bicycle tubing. By rotating the propellers in opposite directions, the torque and gyroscopic forces were cancelled. 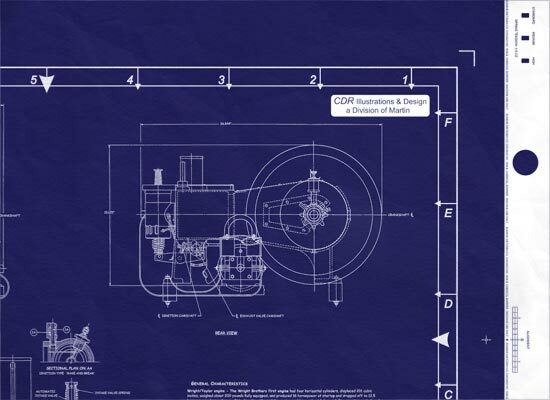 Opposite rotating propellers were used on all subsequent machines except the Model E pusher and the Model L tractor. Unfortunately, after four flights on December 17, 1903, the first Wright airplane was damaged and had to be hauled back to Dayton.